The Transfer Handle® Plus is a patient assist handle that provides security while facilitating getting into and out of bed. The handle is designed to fit on either spring-based or pan-based hospital style beds and is available in either a single handle or double handle model. Handle locks at 45°, 90°, and 180° in both directions, so removal isn't necessary in case of emergency. 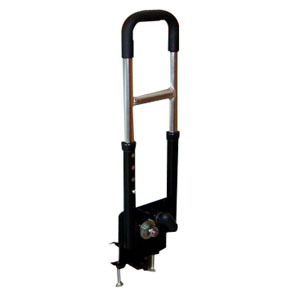 Handle adjusts in height between 19-1/4" and 22-1/4" in one inch increments. Designed specifically for entrapment avoidance. Easily attaches to hospital bed frame and with only an adjustable wrench. Heavy Duty Transfer Board, 35"